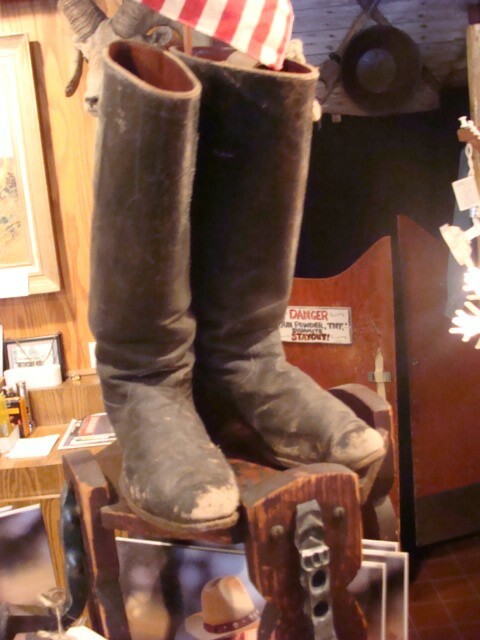 These are 19th Century Boots that were worn by the first woman to attend the University of New Mexico Engineering Dept. She was not permitted to enter the class room, but had to sit in the hallway outside the room on the floor, to listen and take notes. Women were not permitted to attend classes. She was the first woman to graduate from the University of New Mexico. These are 19th Century Boots that were worn by the first woman to attend the University of New Mexico Engineering Dept. She was not permitted to enter the class room, but had to sit in the hallway outside the room on the floor, to listen and take notes. Women were not permitted to attend classes. She was the first woman to graduate from the University of New Mexico. Please email cowboycabin@centurytel.net with questions or call 406 270-2842.